Before going to Guy’s Dental Hospital Andrew studied at Godalming College for two years .He graduated in 1987 and then worked in a long established family Sussex practice for three years. In 1989 Liz and Andrew married and between them, they started the The Mews Dental Clinic in 1991. Andrew enjoys the challenge of a family practice , and says ‘the variety of treating different age groups makes each day stimulating , and different’.One of his greatest pleasures is seeing satisfied patients returning to , and growing up with the clinic. Andrew and Liz live in Godalming and have two daughters .His main interest is Mountain biking , taking him all over the wonderful Surrey countryside and beyond .He finds this the perfect adjunct to the concentration demanded by modern dentistry!. 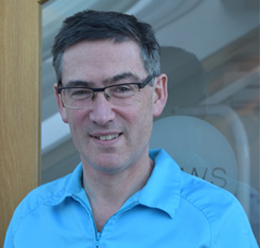 Andrew is a member of The British Society of advanced Restorative Dentistry and the British Dental Association.He enjoys regular postgraduate courses to keep abreast of the ever-changing modern dental world.